The phrase "You Shall Not Pass" may have been inspired by the saying “They Shall Not Pass!” that became popular among the French soldiers during World War II, mostly as a propaganda slogan used to express determination to defend a position against an enemy. It has also been used in the many famous wizard books and movies. Show trespassers this warning sign while letting friends and family know you also have a sense of humor. 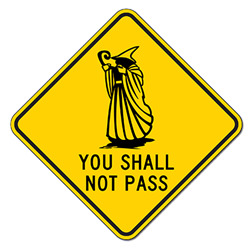 Choose the Colors and Size for this You Shall Not Pass Wizard sign - Available in 18x18, 24x24, and 30x30 sizes. Each size is constructed with heavy-gauge aluminum, Engineer Grade reflective sheeting, and protected with 3M anti-weather and graffiti film at no extra charge. This sign includes 3M Protective Overlay Film (POF) at No Extra Charge! 3M’s high-tech Protective Overlay Film laminate is applied in our factory to protect sign faces against fading caused by the sun and harsh weather conditions—and makes graffiti defacement easy to clear using nothing more than a mild detergent.